Kawkab Amirka, كوكب أمريكا, Vol. 1, no. 43. Articles in English in this issue include: a report on the conflicts fought by the Congo Free State; a profile of French-American explorer, zoologist, and anthropologist Paul du Chaillu; an overview of Montenegro, with particular attention paid to the political unrest that shook the country; a review of a travel guide to Jerusalem; and a short update on Russia's efforts to gain territory in Central Asia. A.J. Arbeely, N.J. Arbeely, and Arteen Effendi Petrakian, “Kawkab Amirka, كوكب أمريكا, Vol. 1, no. 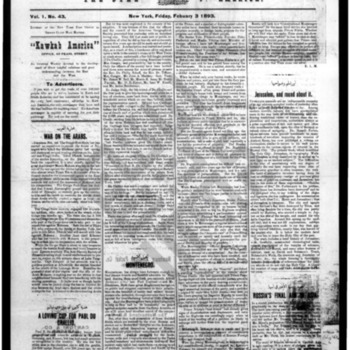 43,” Moise A. Khayrallah Center for Lebanese Diaspora Studies Archive, accessed April 20, 2019, https://lebanesestudies.omeka.chass.ncsu.edu/items/show/11618.